Just one more weekend to finish up the last of the pinks. The new week will bring a new color. Believe it or not, this isn't the last pink Saturday. Next weekend will only be the 30th, so there is still time to keep digging in and catching up. Hope that you are having fun with hot pink and lime green. We are just settling back in after a trip to the Grand Canyon. Anna had her wisdom teeth removed when we got back, so sewing still hasn't bubbled up to the top of the list. Maybe today though. It is going to be horribly hot outside and a bit of sewing time would be quite nice. Misterlinky is below. Please share your pink progress with us all. Pink is such a happy color. Especially hot pink. You may need to work in some other pinks to get enough contrast, but it is all about using the scraps you have after all. I love summer. 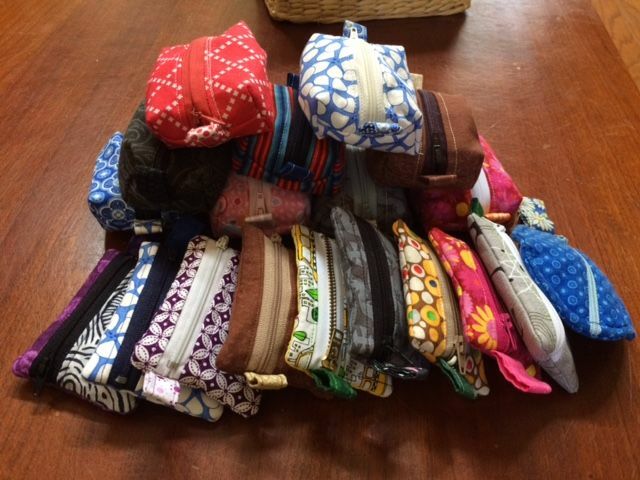 When it is OK to spend an entire day just sewing little zipper cases. I've been on a bit of a cleaning spree, and these little zipper cases are just perfect for all those charging cables and earbuds that nobody can ever seem to find when they need them. It isn't as if we don't have plenty. Hopefully they will be easier to find now. My dear husband has gone to Dungeons and Dragons and taken all the children with him. It is lovely to have a little quiet time alone at home. There are plenty of circles prepped and ready to stitch. Such a nice way to spend the afternoon. 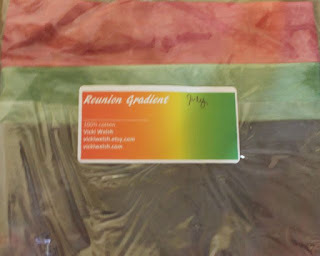 I have several spools of brightly colored YLI silk thread which I ordered ages ago before I figured out that neutrals were so much more flexible. 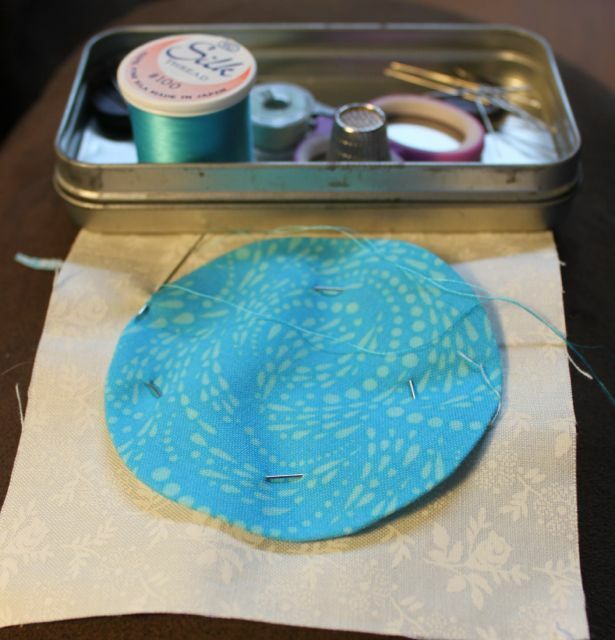 It is fun though, to find just the right combination of thread and fabric. 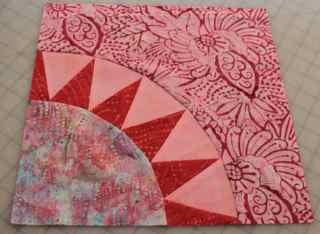 Next I'm off to check out more slow stitching at Kathy's Quilts. Welcome to the Rainbow Scrap Challenge halfway point for the year. July is a great time to take a breath and think about what you'd like to get done before the end of the year. It is a great catch up month too, for those who have missed a color or two along the way. The new color this month is hot pink and if you are feeling particularly adventurous, you can add just a dash of lime green. In celebration of the month of July, I have this hand dyed fabric collection from Vicki Welsh to give away to one lucky Rainbow Scrap Challenge quilter. 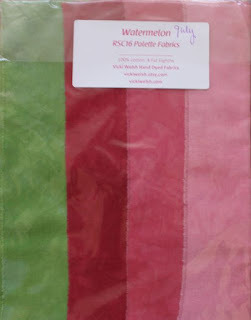 Vicki and I worked together to plan the colors for this year and she was kind enough to send extra fabric to share with you. She has a new web site and fabric shop set up now. Just leave me a comment of this post with the name of the next project you plan to finish if you would like to enter into the random drawing. I'm not sure how the weather is where you live, but summer in Florida is HOT. Best to plan outdoor activities for the morning or the evening. The only place to be in the heat of the day is inside in the air conditioning. Combined with the school vacation, that makes it the perfect time to catch up and try to cross a few projects off the list. Sadly I have a sick sewing machine and will have to work with my daughters until it is back from repair. Until I can dig out the quarter inch foot, these string blocks will be just right. Luckily, the blocks this month uses flip and sew corners which don't need a quarter inch foot either, so I should have plenty to keep me busy and out of the heat for the day. 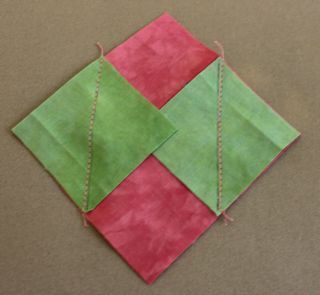 I think there is even some paper piecing hanging out in a project box in the closet just in case things get desperate. I chose a nice simple block for this month. Hopefully that will give everyone a chance to get caught up if they need to, and in the quilt, it will give the eye a little bit of a rest. This block has traditionally been called Indian Hatchet. 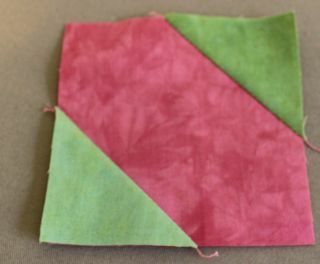 It is a simple square with two flip and sew corners. A lot like a snowball block, but with two corners instead of four. Each block will need one 3.5 inch square and two 2 inch squares. 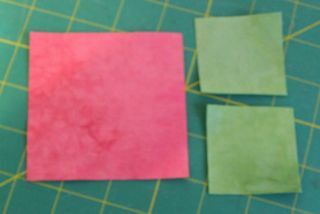 I am using pink and green for July. 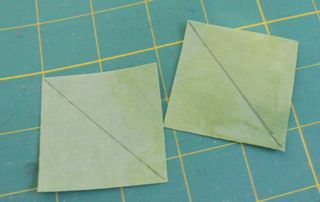 On the back of each small square, draw a line from corner to corner. Pencil will work just fine, I have become very fond of frixion pens because the lines disappear during ironing. Place one small square on each corner of the large square. Make sure that the lines run parallel to one another. Sew on each drawn line. Technically, just one needle width to the outside of each drawn line will give you enough wiggle room for the seam allowance. Flip open the corners and press. 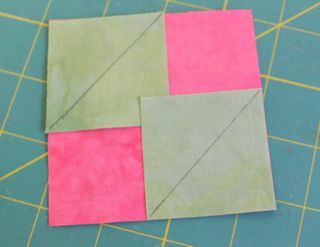 Make sure that the edges of the small green square line up with the edges of the large pink square. Trim away the triangles left underneath the main block. 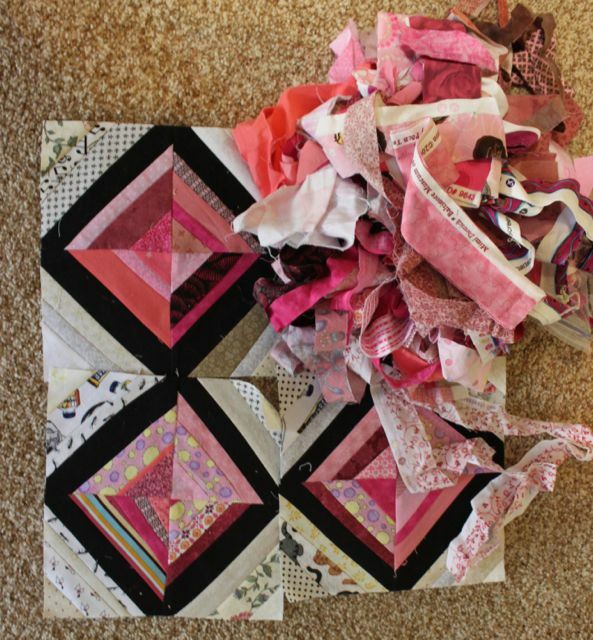 In the finished quilt, these blocks will be alternated to form a simple zig zag line. If you are making the twin sized quilt you will need 24 blocks. For the couch sized quilt, 18 will do it. I know a lot of people were expecting red for July. Instead, we will be working with hot pink. Almost red -- right? 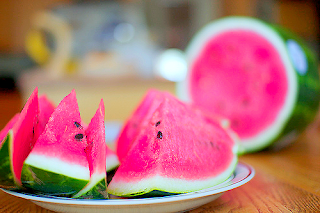 The inspiration is watermelon. Bright pink and juicy with just a dash of lime green rind. The block is going to be a version of Indian Hatchet which is just a simple square with two snowball corners. It is going to be a tiny 3.5 inch size, so plan to make quite a few. I'm off to work on the tutorial now and will be working on updating the list of links and patterns. I've been a bit scattered lately, but today will be my day to catch up.